If you're new to Singapore or not aware, there are consumer protection organisation called CASE that manages and allows you to lodge complaints that you may have with Singaporean businesses. There is also a lemon law that protects consumers in Singapore. Consumers Association of Singapore (CASE) is a non-profit, non-governmental organisation that is committed towards protecting consumers interest through information and education, and promoting an environment of fair and ethical trade practices. It does cost money to lodge complaints ranging from $10.70 to $53.50 SGD depending on the monetary value of the claims. You also need to be a CASE member in order to have them advocate on your behalf, otherwise, the most they can do is only help you draft a letter to the retailer where you have the dispute. The membership costs range from $8.55 SGD per annum depending if you're a student, family, or ordinary member. Lifetime CASE memberships are available too at $428 SGD (inclusive of GST). The lemon law is quite interesting, it allows you as a consumer to make a claim for a defective product sold to you within 6 months of purchase. As described on the CASE website, the Lemon Law came into effect on 1 September 2012. Provisions of the Lemon Law have been added to the Consumer Protection (Fair Trading) Act, with related amendments to the Hire Purchase Act and Road Traffic Act. 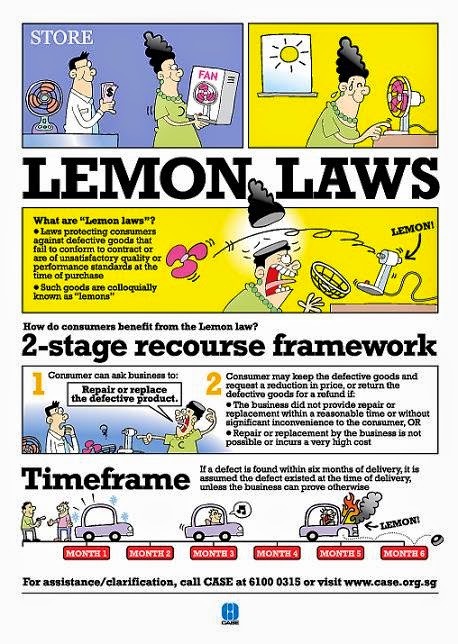 The Lemon Laws is a consumer protection law that provides remedies against defective goods (colloquially known as “lemons”), which fail to conform to the contract at the time of delivery, e.g. do not meet standards of quality and performance, especially after repeated repair. Such laws obligate sellers to repair, replace, or refund or reduce the price of those defective goods. I am not a lawyer, but it's good to know that a law like this is around. After first learning about this, I would sometimes mention it when buying items at Singaporean retail stores. As it helps when they try to push completely unreasonable terms like no refunds and exchanges, when they know there is some layer of consumer protection. So it's good to know and do some more research around this so you can protect yourself as well.